When it comes to the reasons to insulate a steel building, it’s not just about moderating the interior temperature. Keeping your steel building properly insulated will also prevent the growth of mold and mildew as well as prevent rust and corrosion. The following information highlights reasons as well as different materials used to insulate a steel building. In addition to keeping the building comfortable, you should also insulate a steel building to prevent moisture from entering the structure through condensation. Condensation becomes a problem when the indoor and outside temperatures are at a significant variance. As moisture accumulates, mold and mildew will begin to grow, which can be a serious health concern for people with allergies or respiratory problems. Additionally, failure to sustain proper building maintenance practices can and will result in the moisture causing corrosion and rust. Traditional construction materials will typically require the insulation to be installed between the studs. When it comes to the procedures to insulate a steel building, insulation is usually installed above the framing, which provides more continuous protection. Its placement prevents the transfer of heat as well as moisture in between the framing, exterior roof, and wall panels. There are four different types of materials used to insulate a steel building, and each material has varying costs as well as benefits. When you are considering which material is best to insulate a steel building, keep in mind the characteristics of the material should match with the building’s shape, size, geographic location, and the building’s intended use. Reflective foil or foil bubble is a waterproof type of insulation with a reflective surface, which can significantly brighten the exterior of the building. In some cases, reflective foil is more costly, but it’s relatively simple to install. All you need are staples, glue, or nails, and reflective foil doesn’t require any special protective gear or equipment. 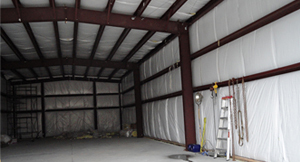 As the most popular and least expensive method used to insulate a steel building, fiberglass comes in a “blanket” or rolls of material and doesn’t require professional installation. However, it’s a great idea to wear protective clothing, especially a mask because fiberglass will shred into fine fibers and irritate your skin. Due to the soft batting fiberglass material and its ability to absorb moisture, it will also attract rodents, birds, and nesting bugs. As a solution, fiberglass is generally sold with a protective facing, which doubles for interior appeal. Insulated panels are made of two metal panels with insulating foam core between them. As one of the more expensive ways to insulate a steel building, insulated panels reduces the need for rigid board installation or fiberglass blankets. In any case, when you use insulated panels to insulate a steel building, the panels will provide great insulation, fast installation, and a modernized appearance. As the universal way to insulate a steel building, foam or “rigid boards” are ideal for practically any type of climate. With several available performance ratings, rigid boards are an effective way to insulate a steel building as well as dampen the exterior noise. In addition, using rigid boards to insulate a steel building doesn’t require a professional and is simple to install. However, you should inform the provider or seller of your steel building of your intent to use rigid boards as the method to insulate a steel building. When you use rigid boards for insulation, you will need longer panel lengths and extended fasteners.